Protect your iPad Mini in style with your very own personalised iPad Mini case. Upload your photos, artwork, and even text to create a bespoke accessory that'll give your tablet the edge. Made from thick, spongy Neoprene, custom iPad Mini cases are the ultimate way to keep your device safe and in pristine condition. These personalised iPad covers are suitable for all iPad Mini versions. Made from soft, cushioning Neoprene, both screen and back are protected from scratches, bumps, dust and the elements. Print both sides using your photos to make a lovely gift or unique way to carry your iPad around. Hand-crafted to order, iPad mini cases are a truly bespoke gift. The specialist printing process binds the ink to the textile, creating an everlasting print that doesn't peel away or scratch off, so your custom iPad Mini case will look great for years to come. Children love to have things customised as it's a chance to express their personality but also have something nobody in the class will have. Also, super cautious mums and dads who need to take their device to work will love a protective Neoprene iPad mini case personalised with family photos. When they put it in their bag or briefcase, they can rest assured it'll be safe from scratches and knocks. For business owners, these are a great promotional gift for customers, or can even be a customary employee accessory. Print your logo and details and extend your brand awareness. Like many of our products, the iPad Mini cases come with a quantity discount, so buy more than 1 today and save money. We print your photos onto our neoprene fabric using a top-of-the-range digital printing technique. This permanently bonds the eco-friendly inks deep into the fibres of the material, ensuring a long lasting print that will not crack or fade. Your printed fabric is then hand-stitched into the iPad Mini case with the addition of the zip and your trim colour choice. Everything is handmade to order to the highest quality, and ready to be dispatched in only 1-2 days. When you're at work or college, laptops and tablets get left around everywhere, so it's important to make sure yours is distinguishable. Print your favourite art piece, a treasured family photo, your name or even an original graphic design to stand out and show off your individuality. Create an iPad mini personalised case as a gift to a loved one, featuring a photo and special message that means something to them. Or go down the comedic road with a witty pun like 'The Best Things Come in Mini Packages'. Send this to your husband and let him interpret it as he wishes! For the kids, design a photo iPad mini case using images of their favourite pop stars, superheroes or animals. Printed with their name, they'll be super chuffed to take it on holiday, car journeys or to their friends house. It's also the best way to encourage them to keep their iPad mini protected. Design tips: We stitch the two sides together using a binding trim, so approximately 1cm on each side is sewn into the hem. When designing, keep important features away from the edges to guarantee they won't be lost in the hem. Choose from four trim colours: black, green, maroon, or neutral stone. Your design can be either landscape or portrait, so double check your photos in the preview to make sure they're the orientation you want. Personalised leather ipad mini covers. 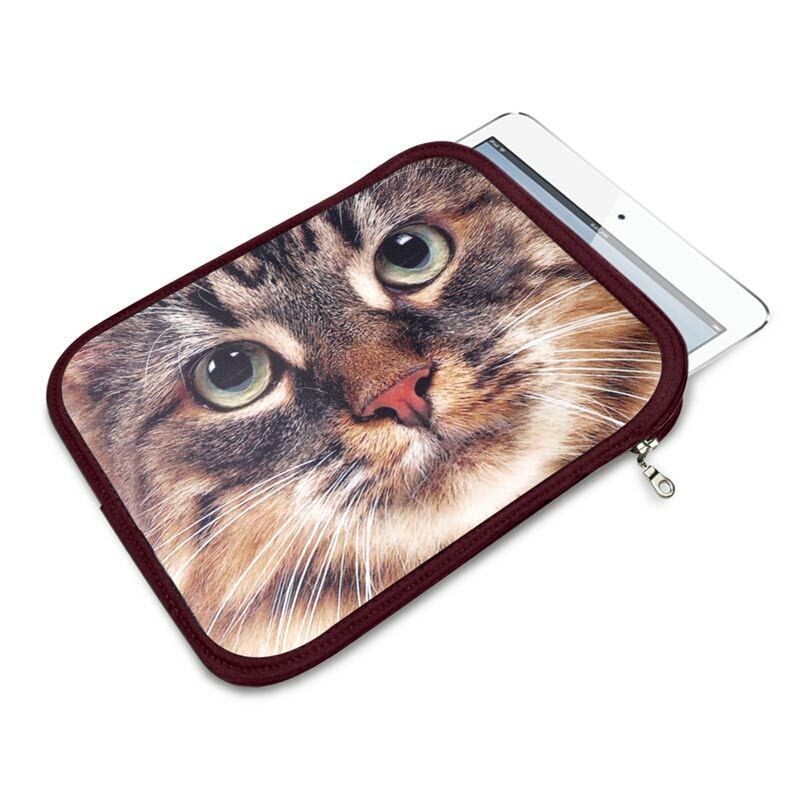 Design your ipad mini case or ipad mini sleeves right here. Leather iPad Mini cases.